“I like an anything goes approach,” Kaori Yuki assets in one of her creator’s notes in the first volume of Grand Guignol Orchestra (Viz.) This statement is about as close as Yuki comes to understatement anywhere in this paperback. And that’s fine. 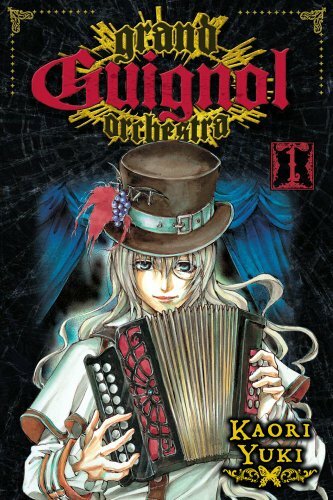 Given that Grand Guignol Orchestra is a sort-of period piece about a group of musicians who fight zombies, one should only expect so much restraint, and given that it’s by Yuki, one would be lucky to find any restraint at all. It’s not one of her defining characteristics, and I can’t imagine that it would really be one of her strengths. There’s an undeniable charm in the idea of musicians being the only thing that can destroy zombies (zombies that look like dolls, no less). It’s sort of like Mars Attacks!, but much more sincere, and the music isn’t just a gag at the end. The orchestra itself is more of a combo, starting with three members and adding a fourth by the end of their first adventure. Membership seems limited to the androgynous and the thuggish, though only half the regular cast is properly developed in this first volume. Yuki is fond of twists, and things are seldom entirely what they seem. She has mixed success with the reveals; sometimes they’ve got a creepy jolt, sometimes they’re just mildly confusing. But it’s nice to see some narrative punch mixed in with the faux-European aesthetic (which you cannot deny is lovingly, sometimes ravishingly rendered) and the sly-cool cast of characters. As is usually the case with Yuki’s work (in my admittedly limited experience), the real successes come in the form of smartly conceptualized horror. In this case, it’s the guignols themselves, disease-stricken innocents who’ve become a kind of cracked-porcelain zombie. Yuki adds a layer of sweetness and powder to the decay, which always makes it more unsettling, at least in my opinion. But while Yuki’s work always has its points of appeal, I’m never entirely sold. She strikes me as having the potential to become a more commercial Junko Mizuno if she could just strike that balance between creative focus and intellectual abandon and emotional shamelessness. Yuki seems to be always on the verge and never quite there, at least yet. But I do love to see a reliably popular creator in any comics category who also seems at least a little bit deranged. You are currently browsing the The Manga Curmudgeon blog archives for the day Monday, October 18th, 2010.